This is an M42 screw mount SLR camera made by Wirgin in West Germany, around 1963. 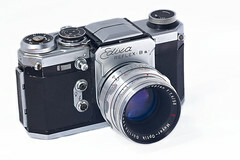 It has an interchangeable viewfinder, the one here is shown with the “waist-level” finder with loupe. Shutter speeds: 1s - 1/1000s, B. Separate selector for speeds 1/8s and slower. Flash sync: Unknown speed, has X- and M-sync connectors, no hotshoe. Viewfinder: Interchangeable, waist-level with loupe or pentaprism. Has a sliding shutter-lock switch on the front, next to the shutter release. The shutter release itself is unusually placed in the front instead of on the top, but this way is actually more ergonomic with the waist-level finder. There is no provision for cable release. Unlike many other vintage cameras, the light-seals in this one do not seem to deteriorate with age and thus probably don't need replacement. The mirror damper foam, however, does degrade and will probably need to be replaced. I've replaced mine myself with good results.